Hey Friends!! Hope you’re kickin’ your week off in a great way! Halloween can certainly be frightful for some! Don’t you think? But…when it’s “Frightfully Delightful, Halloween takes on a whole new meaning! 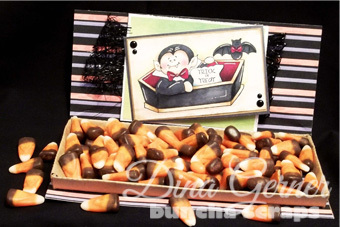 … and stamped with High Hopes Stamps new release “Vampire Treat” with the sentiment “Frightfully Delightful” . 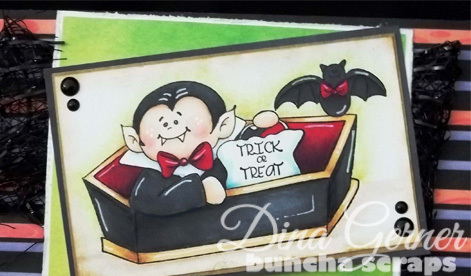 This adorable little Vampire is hidden, just as he is in his little coffin, tucked away under the cover of this Halloween candy box. This would make a great gift box for your favorite little Frightfully Delightful Trick or Treaters this Halloween Season. You can find the template for this box on Jamie Lane’s blog, Bits of Paper! Hope this gives you some inspiration to get into the Halloween state of mind…whether it be Frightful or “Frightfully Delightful”, enjoy the journey. The entire Boo Crew Collection is available for download! Buncha Scraps – so many possibilities, so much fun! Hey Friends! Just popping in with some more Halloween inspiration! This is actually a larger collection than usual with sixteen 12×12 Digital Designer Halloween Papers! This time, I broke up the embellishment pack and created the Boo Crew Embellishment Collection without the papers. This collection is pack full with 59 Halloween images! I have to admit, Halloween is so much fun to create for. I love the colors and the whimsy of Halloween….and as I’ve stated before, Buncha Scraps is safe and family/kid friendly, so we do Halloween with fun & whimsy…never scary! Super fun Boo Crew Halloween Tags & Text Collection which includes 10 Word Art Phrases, 3 Round Halloween Tags, and 2 colorful Halloween Journal Cards! And of course, a whacky, quirky Halloween Alphabet which comes with 3 color variations and includes a Number set as well. So there you have it! The Boo Crew is complete and ready for Halloween antics! What will you do with the Crew? Scary Kitty? Hardly! This adorable image is one of my new images for High Hopes Stamps new release “Joys of the Seasons” called… what else?…”Scary Kitty”. Halloween is never really scary here at Buncha Scraps. I used our new “Boo Crew” collection background papers Halloween Stars & Swirls in black for the 5×7 card & the coordinating envelope. There are so many advantages to using digital art for your paper crafting projects, but one my favorites is being able to size my papers up and down to fit my projects. I created this envelope using We R Memory Keepers Envelope Punch Board. For my Canadian friends, OneCrazyStamper.com carries the Envelope Punch Board also. This little gadget makes it super easy to make your own designer envelopes to coordinate with your handcrafted cards. I LOVE it! For the embellishments, I used YNS Black Gumdrops for the centers of the paper flowers that I punched out from the “Orange Black Spot Dot” paper, and on the Scary Kitty Image. I also used Halloween Orange & Black Polka Dot Ribbon and added a white scroll border that I punched with my EK Success Border Punch. The Boo Crew is available now for immediate download at BunchaScraps. There are so many possibilities and way too much fun! So be sure to create lots of memories, because, every moment is a gift! Visit us on Facebook, Twitter & Pinterest. Just a quick post to let you know…..The Boo Crew is coming…are you ready? This collection is going to be so much fun with endless possibilities! There are 16 fabulous designer papers with this collection just waiting to be a part of all your Halloween paper crafting and gifting projects! The Boo Crew is coming…..Start planning your Halloween parties, decorations, gifts and goodies! I hope you all have a GREAT weekend! Stay safe, have fun, and create lots of memories because every moment is a gift! Be sure to visit us on Facebook, Twitter & Pinterest. Hey friends! Hope you all are looking forward to the big “End of the Summer” weekend! I say this as I sit here in 90 degree weather. It surely doesn’t feel like the summer is over, does it? But, the calendar tells us it is so. 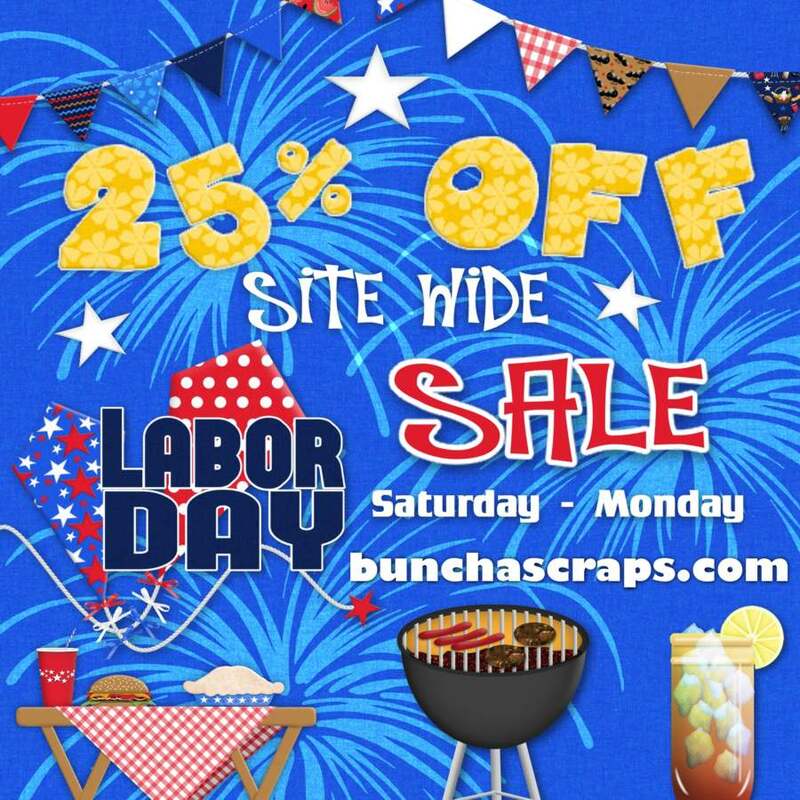 So, in honor of Labor Day, and all of our hard working friends, Buncha Scraps is running a sitewide 25% OFF SALE Saturday through Monday! That’s 3 full days to shop and save. Is it really the end of the summer already? 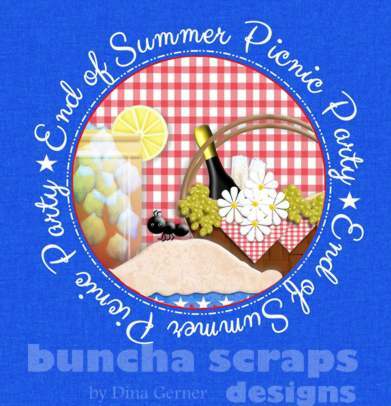 Well, in honor of the end of the summer, and all the celebrations that go along with that, I have created a new collection called “End of Summer Picnic Party”! As always, I’ve created some add-ons for this collection. So far the Picnic Party Border Collection is ready for immediate download. But, I am working on some Tags & Text and Frames as well. Enjoy your End of the Summer parties and celebrations. I can’t wait to see all your creations! It’s BACK TO SCHOOL this week! I can hardly believe it. Where has the summer gone? No worries. Buncha Scraps has created a “Back to School” collection to help you remember that special day/month/year of you ,or your children’s, school days! As you can see, the bundle is packed full of goodies for all your school related paper crafting and scrapbook projects. As always, Buncha Scraps offers a just the designer backgrounds papers on their own, but they are also included in the bundle collection. I’m still creating some add-ons for this collection, so please check back soon to see what’s new.